Construction of Dubai Mall to the left and Dubai Fountain in the foreground. 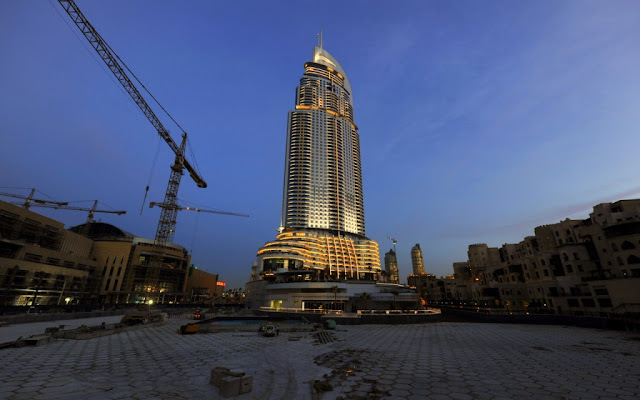 From 2008 to 2009 and again from 2010 to 2011, I pretty much lived through the frenzied, breakneck-speed, 24/7, round the clock phases of construction of two of the major trophies - the world's tallest building (Burj Khalifa) and the world's largest shopping centre (Dubai Mall) which includes Dubai Fountain, my favourite attraction in the city - in this mammoth development known collectively, albeit generically, as Downtown Dubai. Those years were spent in brand new, low-rise, Arabesque apartments in the Old Town sector where I slowly navigated to and from my home on temporary dirt roads that would change course and direction every few weeks, peering through a constant dusty haze of construction debris and sand, passing tens of thousands of foreign labourers from the Indian subcontinent and mainland China in dusty overalls, and enduring the inevitable weekend traffic snarls created by the locals, tourists and expats as they flock to the core to eat, drink, shop, stroll and gawk. To this day, I consider myself very lucky to have personally witnessed the rise and completion of these incredible buildings; outside of a handful of major cities (those in China come to mind,) there are not a lot of nationally or privately funded projects that can drastically transform a cityscape in such a remarkable way, and in a heady short span of time. Fuelled by deep financial reserves, the ones in the Middle East (especially Doha, Manama, Abu Dhabi and of course, Dubai) are growing at supersonic speed, but bricks, mortar and vanity architectural constructs are the easy "gets;" hopefully, the slower-to-implement but more beneficial social infrastructure and sustainable eco-practices will be able to play catch-up within these highly ambitious nation-wide urban planning sagas to produce truly world-class cities, in every sense of the word. 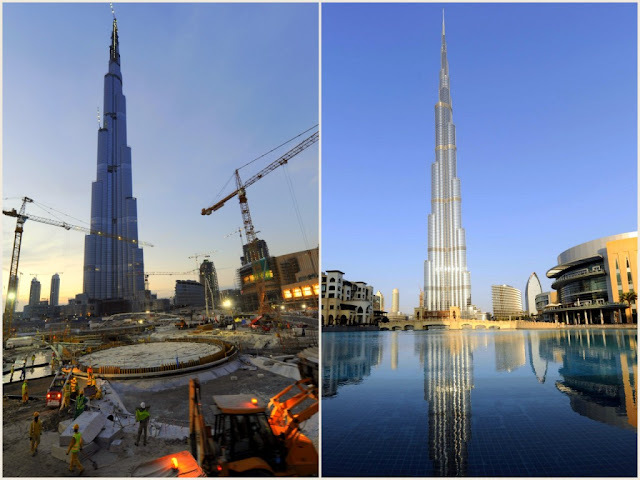 Before and after: Burj Khalifa, Dubai Mall and Dubai Fountain.